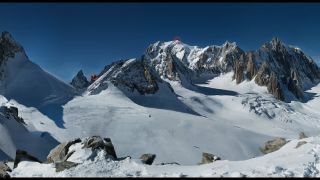 Mont Blanc now has an image the size of a football pitch. It may only be the world's 11th tallest mountain, but Europe's Mont Blanc is now the subject of the world's largest photograph. In2White, a photographic project headed-up by Italian photographer Filippo Blengini has usurped the 320 gigapixel panorama of London taken in 2013, which previously held the title, with an image that is 45 gigapixels larger. Capturing the entirety of Mont Blanc, this 365 gigapixel image required 35 hours of continuous shooting to capture the 70,000 pictures that make up the portrait. It took two months of post production to stitch the 14 Photoshop files together, resulting in a total file size of 46 terabytes. Not just a feat in photography, the five international members behind the Mont Blanc image, had to trek for an hour from the nearest structure to a height of 3500 meters above sea level and endure temperatures of minus ten degrees in order to capture the images with a range of Canon DSLRs. There is an interactive image on the In2White website that shows a version of the full panoramic image, which can be can be zoomed in on to see everything from an eagle (kilometers off in the distance) to the construction site of a futuristic €105 million cable car station. Interestingly, the final image is so large that if it were printed at 300dpi, it would be large enough to fill an entire football field. Technically NASA has a bigger 681 megapixel image of the moon, but it was taken by a satellite and it doesn't really fit the biggest image in the world title.